Sunscreen is another product that might contain a lot of chemicals that you do not want to put on your and your family member’s skin. As we use sunscreen in water some substances are also an environmental hazard. 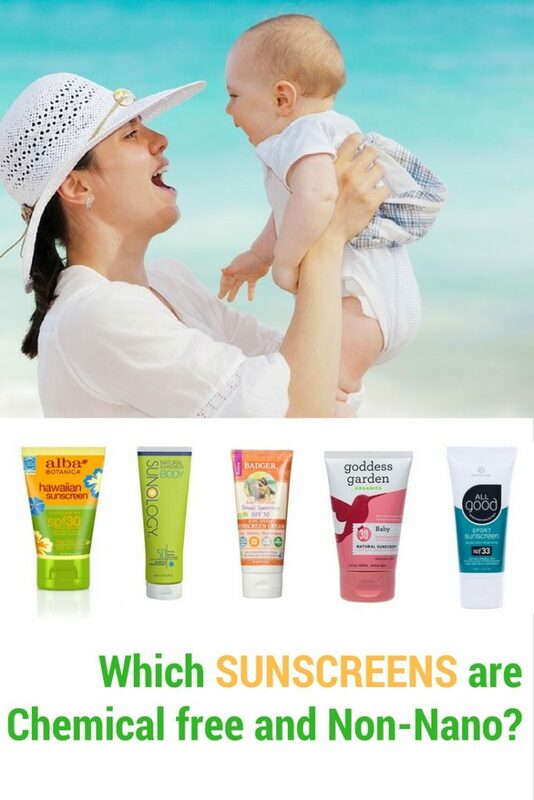 In this article we look at common ingredients like Parabens and Oxybenzone and provide you a list of Sunscreens that are a safe choice. Oxybenzone or Benzophenone-3 is used in most conventional sunscreen products. It is one of the most common chemical UV A/B filters that forms colorless crystals that are readily soluble, and provide a broad-spectrum UV coverage. However, modern research shows that oxybenzone is absorbed by the skin. It gets into the bloodstream and may cause allergic reactions. But it can also mimic estrogen in the body. BP-3 has also been linked to the bleaching of coral reefs and found to interfere with reproductive systems in fish, including feminization of males and reduced egg quality in females. Parabens are widely used as preservatives in cosmetic and pharmaceutical products. The bad news is that they mimic estrogen and have been linked with breast cancer in women and declining sperm counts in men. You should also watch out for the term “Fragrance” in the list of ingredients. This term is often used to cover up the presence of toxic Phthalates. Fortunately there are alternatives on the market. Sunscreens containing mineral UV filters such as zinc oxide or titanium dixode. These minerals are physical blocks that sit on the surface of the skin without entering the human body. They reflect the UV rays and prevent them from penetrating the skin. Why is micronized better than Nano? Because the application of titanium dioxide or zinc oxide leaves the skin with a telltale white sheen, the cosmetic companies have developed nanoparticles (tiny microscopic particles) for the use in sunscreen. However, recent research studies now link nanoparticles of zinc oxide to the generation of free radicals and nanoparticles of titanium dioxide to DNA changes. Especially organic and all-natural brands therefor use “micronized” particles, instead. These are larger than nanoparticles and should not penetrate a cell membrane. BPA & phthalate-free tube ecyclable plastic. contains only USDA-certified organic ingredients, including sunflower oil, green and black teas, coffee, hemp seed oil, cocoa butter and mango butter. high concentration of zinc oxide, sunflower oil and organic beeswax to moisturize the skin, and chamomile to soothe it. Chemical-free, paraben-free, petroleum-free, PABA-free, fragrance-free.